Mt. 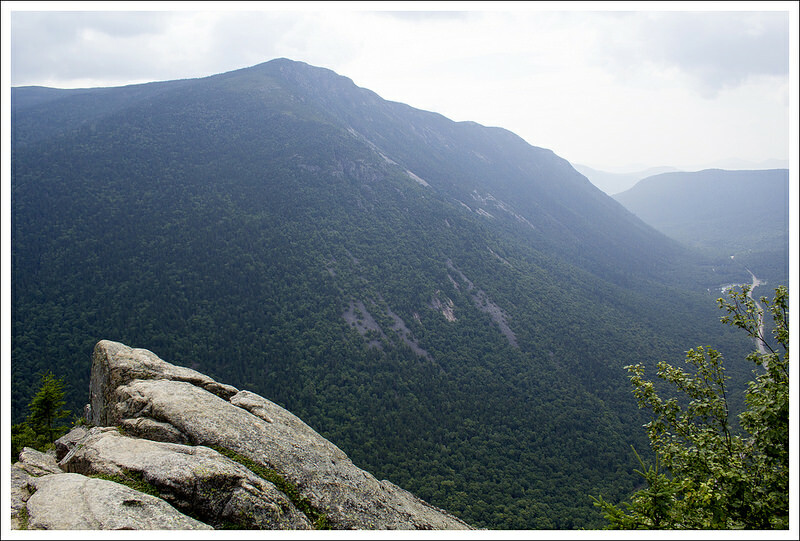 Willard is one of the most popular easy day hikes in the White Mountains region. 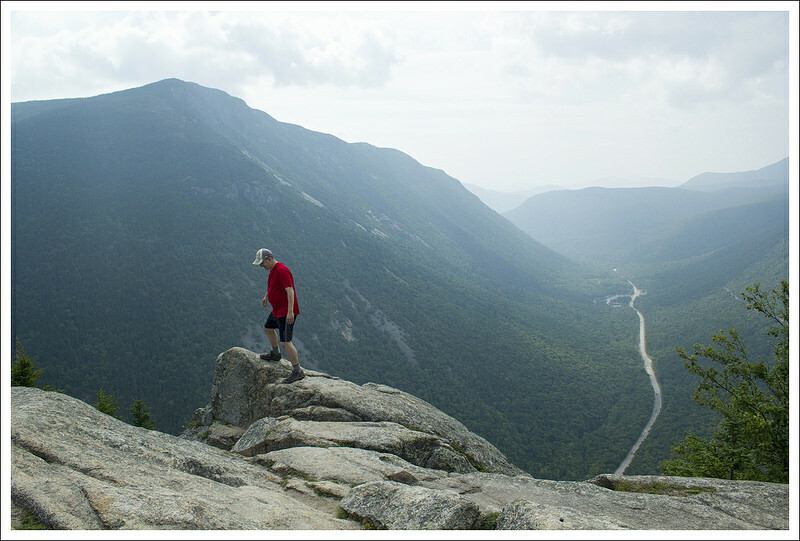 Its highpoint of 2,800 feet is dwarfed by most every other mountain around, but it still offers a dramatic vista looking through Crawford Notch. Looking through Crawford Notch from the summit of little Mt. Willard. You can see the road and the train tracks. 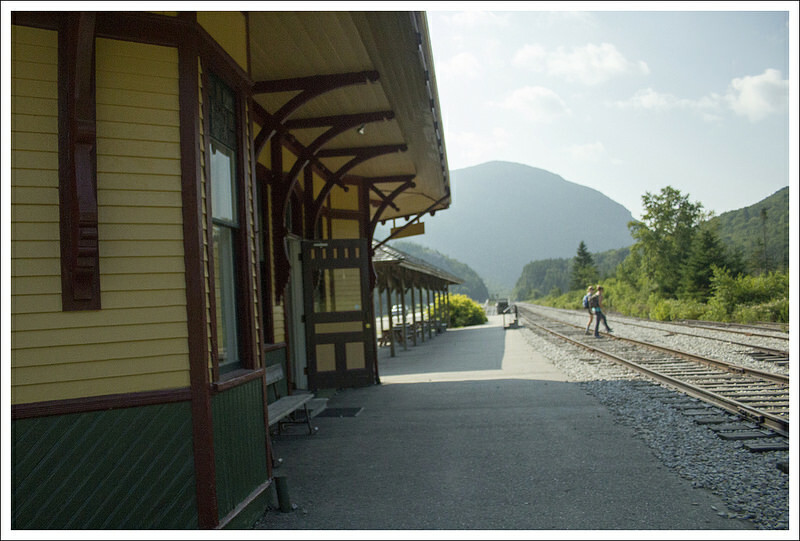 Below: The trail starts across the train tracks at Crawford Notch Depot; Christine’s dad looks down at the Centennial Pool – one of the attractions on this hike; Enjoying the summit with family. 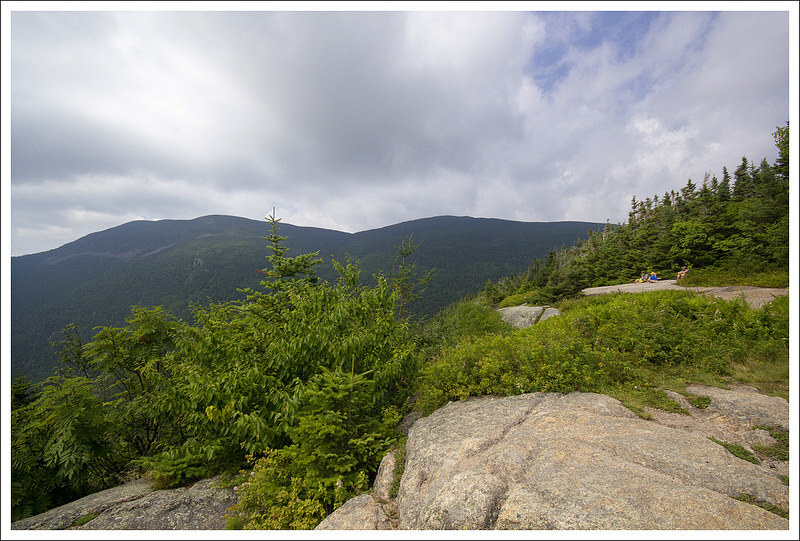 Mount Willard is an extremely popular family hike in the White Mountains of New Hampshire. 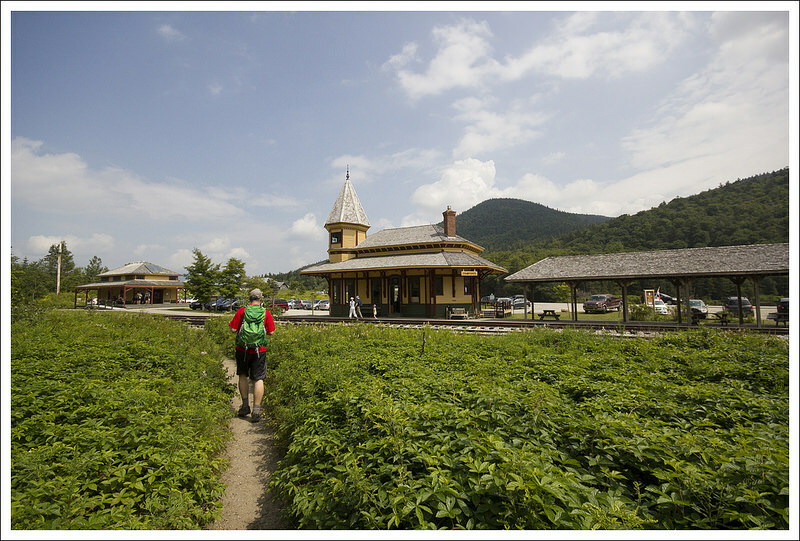 It’s quite accessible since the trail takes off from the train depot at Crawford Notch. 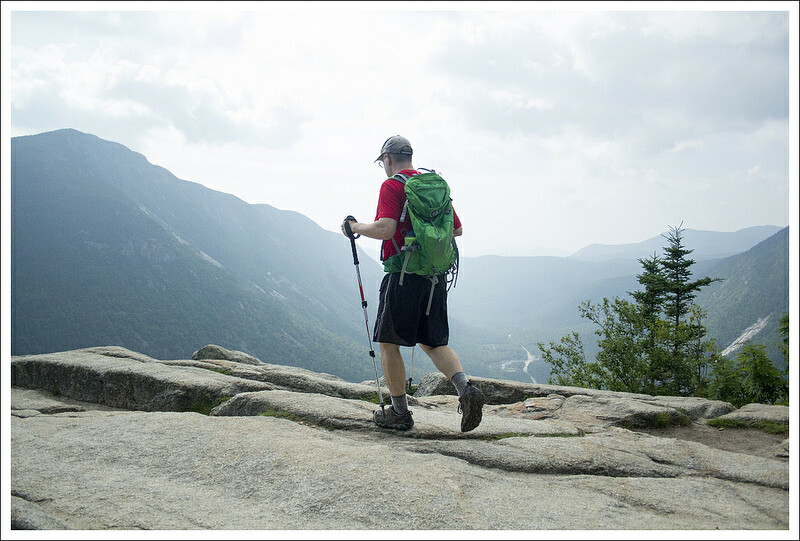 Many hikes in the Presidential range can be intimidating, but this hike of only 3.2 miles is more manageable. The hike has some rocky, steep sections, but if you take your time most people with a little hiking experience can reach the peak. We started off the hike by crossing the railroad tracks near the train depot station where the AMC Highland Center is located. 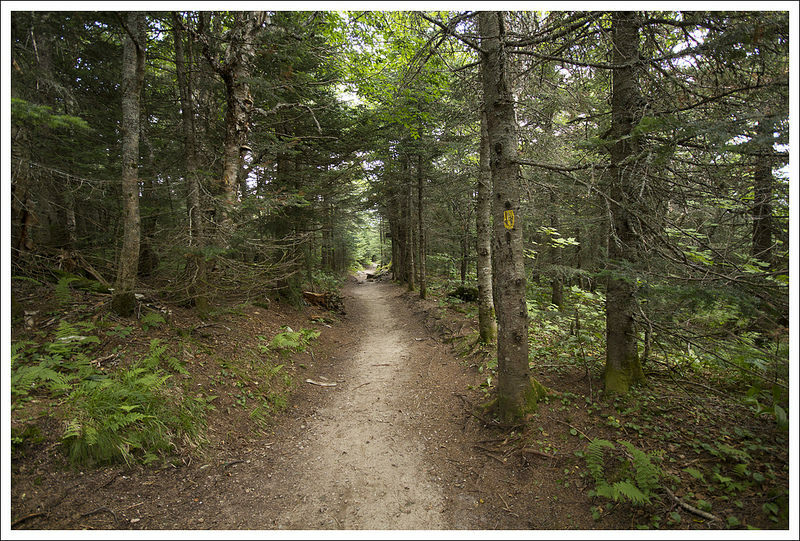 The trail quickly leads into the woods and in .1 mile, you reach a junction. Take a left to climb the Mt. Willard Trail (the other trail at the junction is the Avalon Trail, leading to Mount Avalon and Mount Field). The trail has a small stream crossing and then begins the climb. 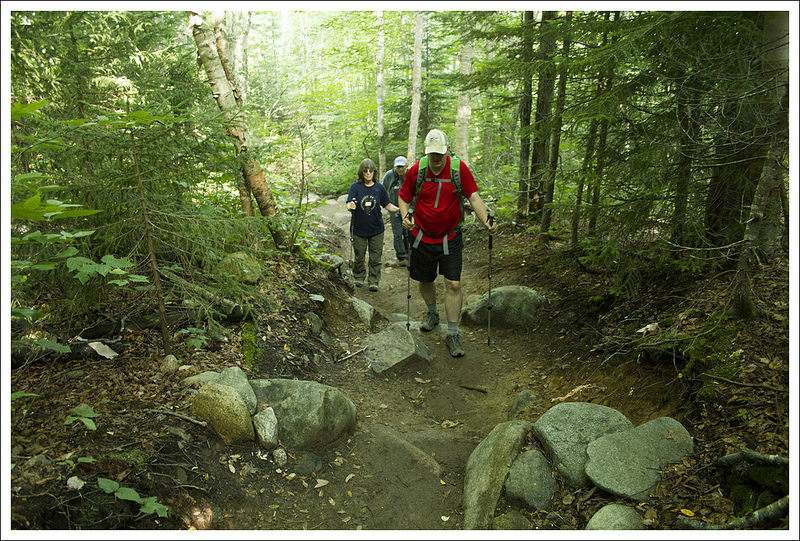 The trail is rocky and somewhat steep, like most of the area in the White Mountains of New Hampshire. The Centennial Pool has a small waterfall that cascades into a pretty plunge pool. Below: Adam crosses a stream early in the hike; Everyone makes their way uphill; The trail was mildly rocky. Along the hike up, there is a small waterfall called the Centennial Pool on the right. There are a few steps down to reach the base of the falls, which is a nice cascade to give yourself an excuse to take a break on the way up. 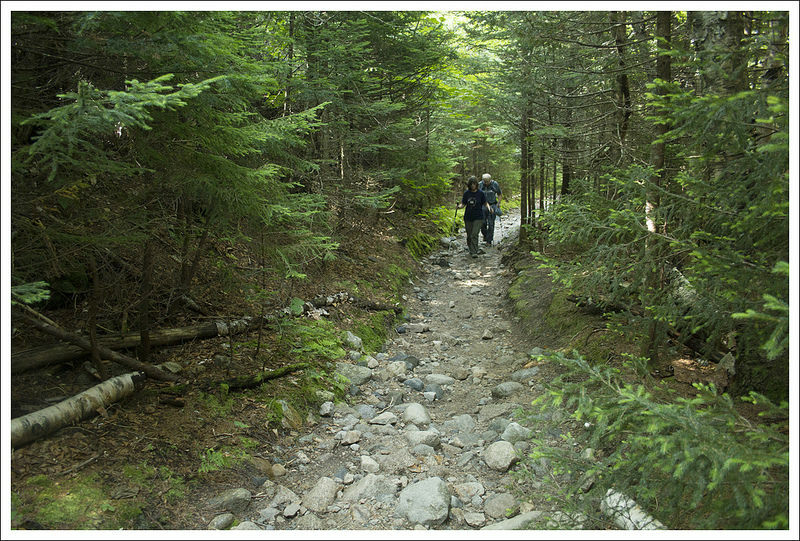 Continuing up the trail, eventually the path of the trail consists of smaller, but more abundant rocks. A short distance of climbing through this and then the trail begins to level off around 1.4 miles. It is a short distance at this point to reach the summit at 1.6 miles. 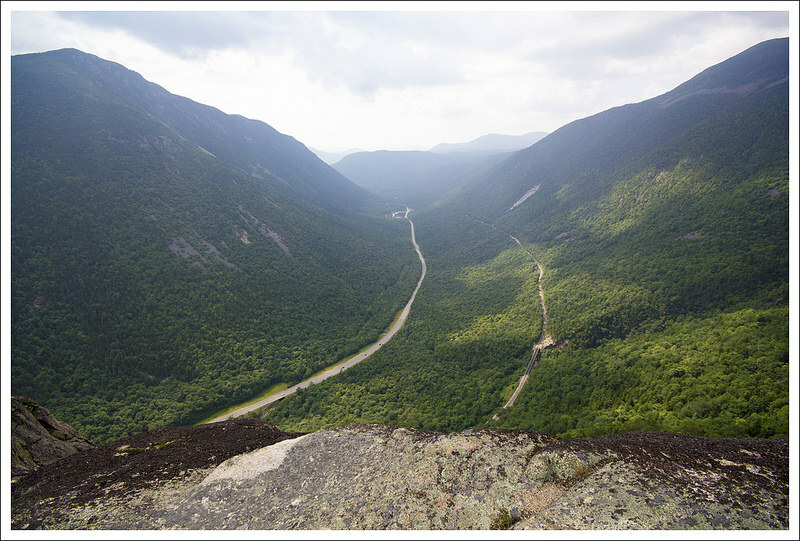 The summit gives you great views down into Crawford Notch as you can see down Rte. 302 and the train tracks that would leave from the depot. You can see the path of the glacier that carved out this area. There are some precipitous drops from the top, so keep a close eye on any children. We stayed at the top for a while until it started to become overcrowded with larger groups, so we made our way back down the way we came. After the hike, we went into the train depot where they have a small gift shop to purchase shirts or hiking guides. 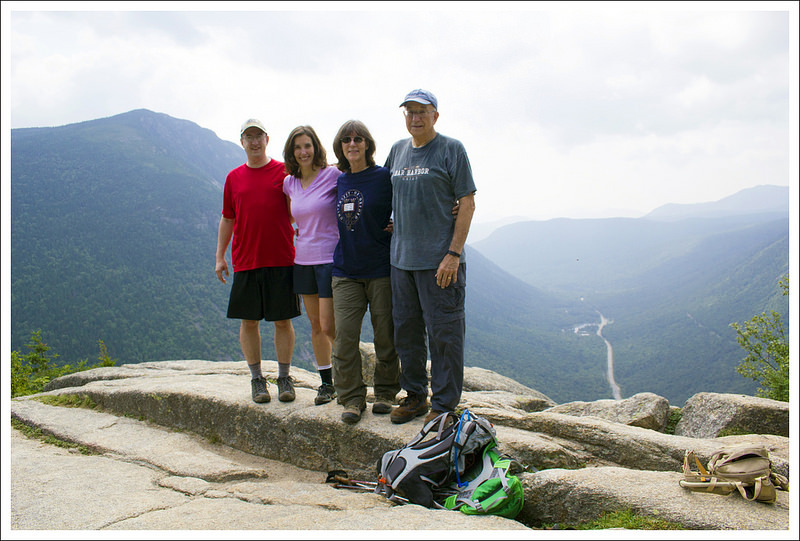 After we left the area, we headed down to one of our favorite lunch spots, Moat Mountain in North Conway, NH. Their nachos are amazing and we’ve always been impressed with the beer they brew there. When I say that Mt. Willard is a favorite family day hike, I mean that literally! My parents walk to the summit of Willard several times a year. It’s probably one of my dad’s very favorite hikes in the region. It’s the right distance and right amount of climbing for them, plus they really enjoy the view from the top. 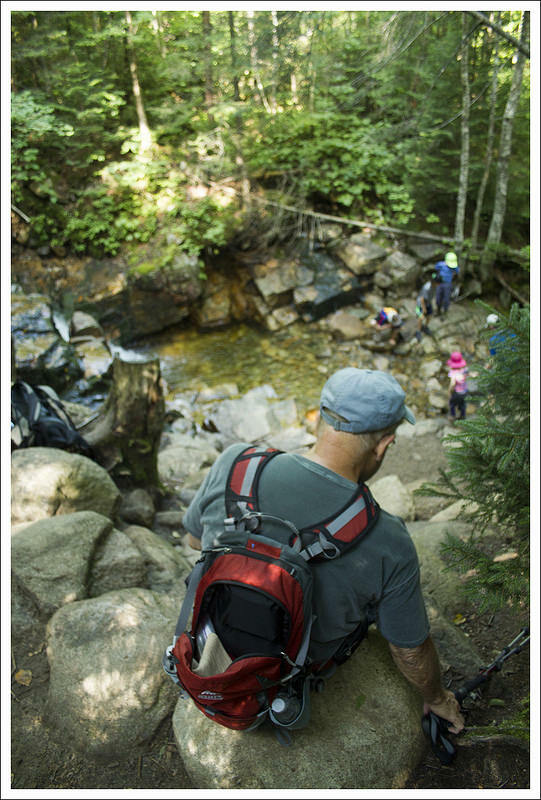 They prefer to leave the high peaks and steep climbs for us to do on our own, but we always like to try and find a hike we can all do together. On this visit, Willard fit the bill perfectly. Before setting out for our hike, we stopped in Sugar Hill for a big pancake breakfast at Polly’s Pancake Parlor. It’s a standing tradition to eat there at least once on every visit. I love all the different batters and pancake fillings. They also have delicious chicken-apple sausage. Adam checks out the Mt. Willard Summit. Below: Summit scenes. We got an early enough start that we were able to begin our hike by mid-morning. We set out across the train tracks and headed up the Mt. Willard trail. The climbing on Mt. Willard is steady, but never terribly steep. 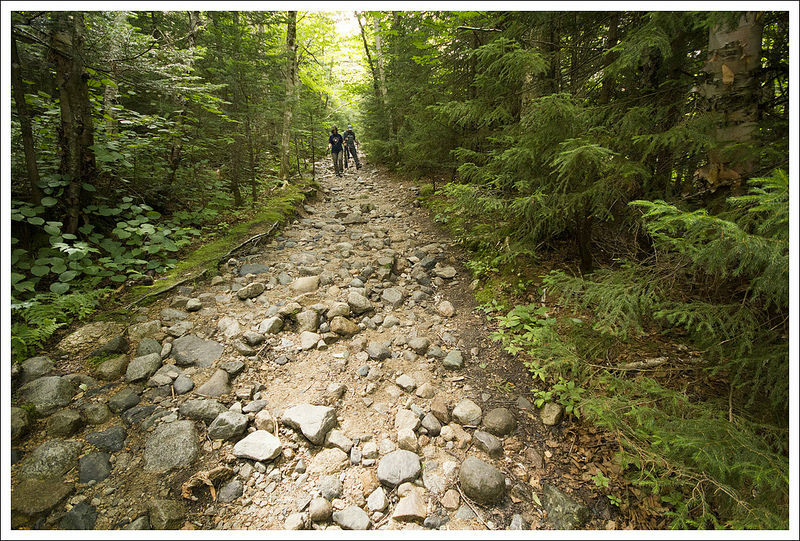 The trail is rocky, but nowhere nearly as rocky as what you see above treeline. It was a humid day, so everyone was sweating like crazy. Thankfully, the bugs weren’t too bad and we were able to hike without bug spray or constant swatting. At half a mile, we passed the Centennial Pool. I scrambled down to the base of the falls and snapped a few photos before a large family group caught up to us. The group of twelve included many young children who wanted to scramble on the rocks around the pool. We left the spot to them and continued our uphill climb. 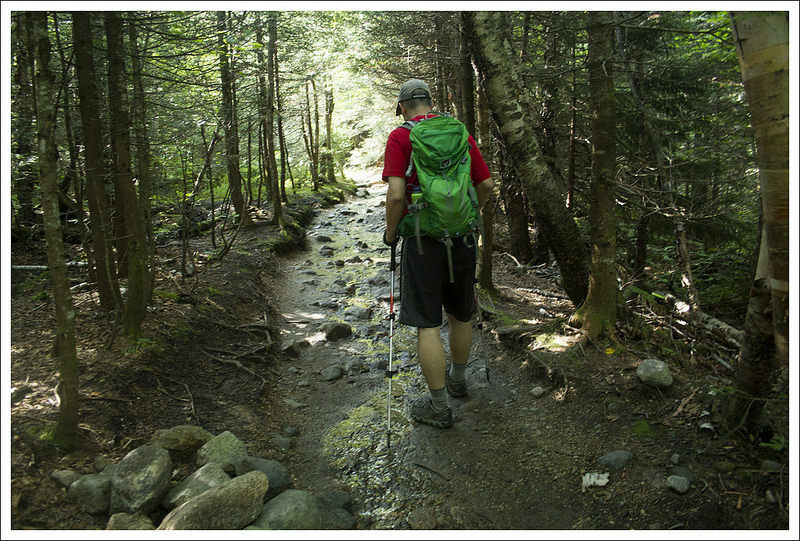 As we continued upward, the trail became rockier and wetter. Thunderstorms the day before left plenty of water still draining off the mountain. There were a couple places that the trail was more like a shallow stream. When we reached the summit, there were only a couple people there. We claimed a nice spot overlooking the notch below. We took photos and enjoyed the view together for a few quiet moments. Soon enough, lots of other hikers began to reach the summit. Children were running pellmell all over the summit. Fortunately, it’s a safe and wide summit. There are steep drop-offs, but the ledge is spacious enough that there is plenty of room to enjoy the view without ever getting close to the edge. The trail is rocky and cobbled. Below: Some parts of the trail were wet from thunderstorms the night before; The trail is pretty, piney and shady: Returning to the depot. After exploring the summits different views and angles, we decided it was getting a little too crowded at the top. We gathered our gear and started the descent. The hike down went pretty quickly. We passed many people climbing up as we descended. It’s definitely a popular and well-traveled trail. We soon arrived back at the train depot. After the hike, we headed into North Conway for lunch. It was a great day and I loved spending some time on the trail with my parents. Difficulty – 3. Not too tough by New Hampshire standards, but a moderate uphill climb. 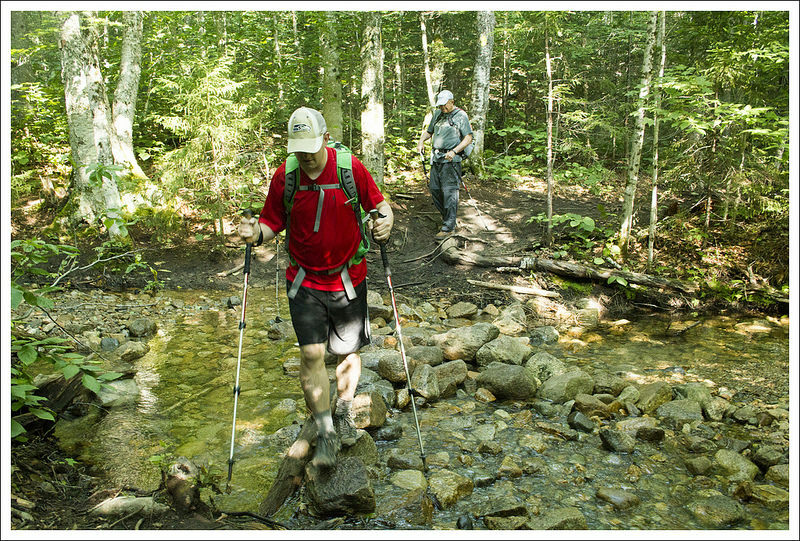 Trail Conditions – 3. The trail is rocky and does have some loose rock. Due to the popularity of the trail, the path is normally clear of debris. Views – 3.5. There are some nice views from the summit. Waterfalls/streams – 2.5. 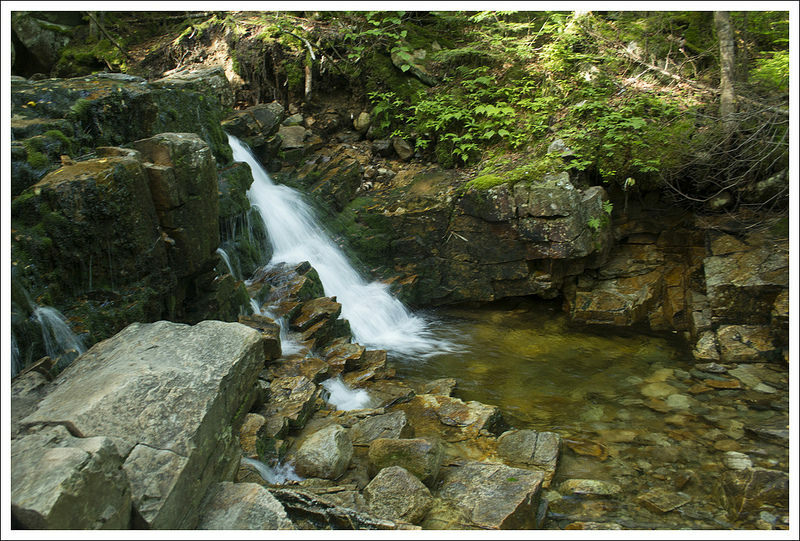 The Centennial Pool is a picturesque waterfall on the way to the summit. Wildlife – 1. I wouldn’t expect to see anything on this trail. Ease to Navigate – 4.5. Once you find the trail and take a left at the junction, it is just on one trail so it should be easy to find your way. Solitude – .5. This trail is extremely popular. Start off early in the morning if you want the summit to yourself. Directions to trailhead: From I-93, take exit 35 to merge onto US-3 N toward Twin Mountain/Lancaster. Stay on that for 10.4 miles and then take a right on US-302 E. Go 8.3 miles and the AMC Highland Center will be on the right. Park in the parking lot and make your way towards the train depot station. Cross the train tracks and you should see the trailhead leading into the woods.